The healthy skeletal system is made up of bones, ligaments, and cartilage. What is the skeletal system made of? 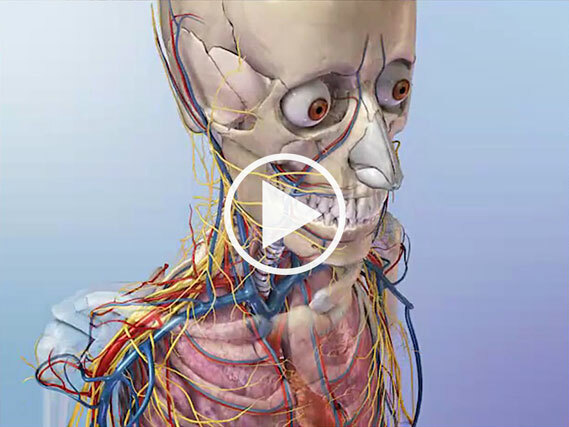 What does the skeletal system do? At the simplest level, the skeleton is the framework that provides structure to the rest of the body and facilitates movement. 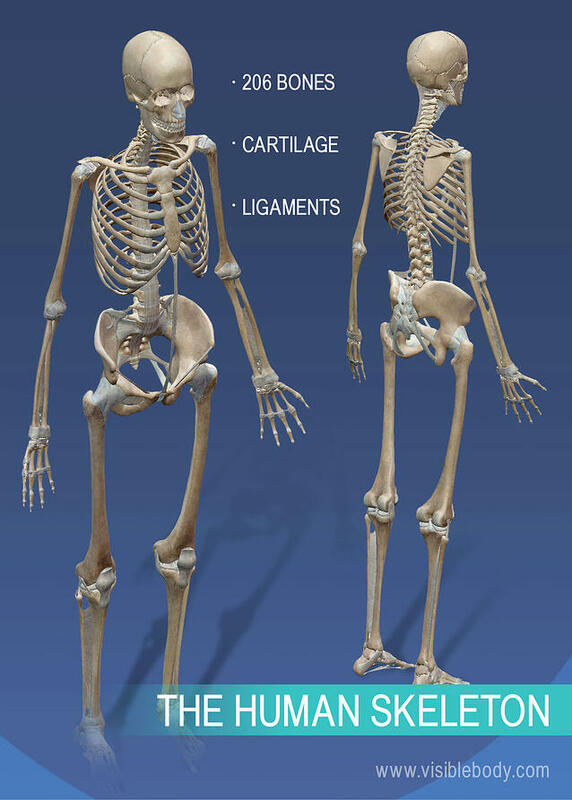 The skeletal system includes over 200 bones, cartilage, and ligaments. 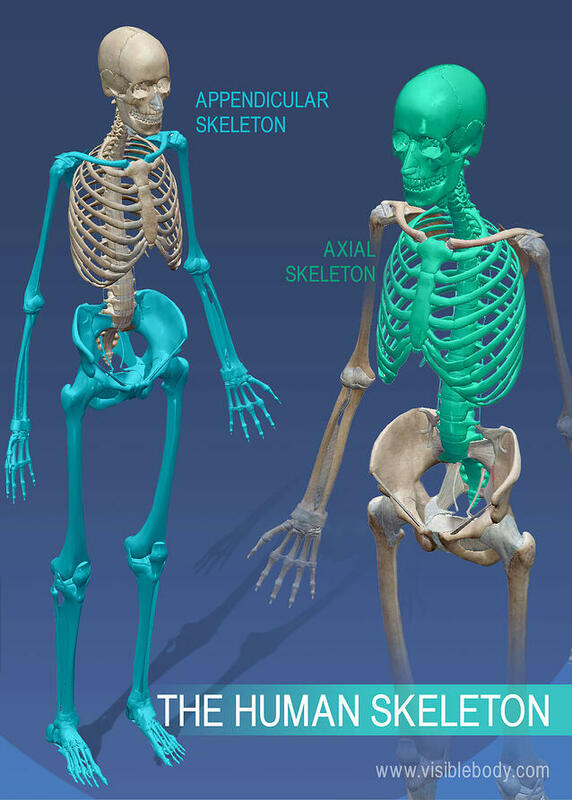 Read on to get 10 key facts about the human skeleton. When you look at the human skeleton the 206 bones and 32 teeth stand out. But look closer and you’ll see even more structures. 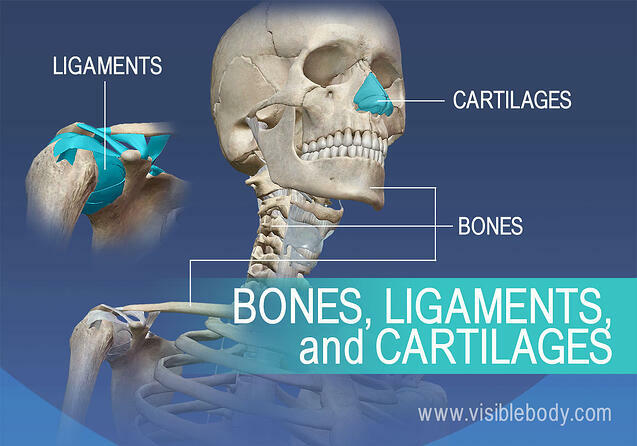 The human skeleton also includes ligaments and cartilage. Ligaments are bands of dense and fibrous connective tissue that are key to the function of joints. Cartilage is more flexible than bone but stiffer than muscle. Cartilage helps give structure to the larynx and nose. It is also found between the vertebrae and at the ends of bones like the femur. 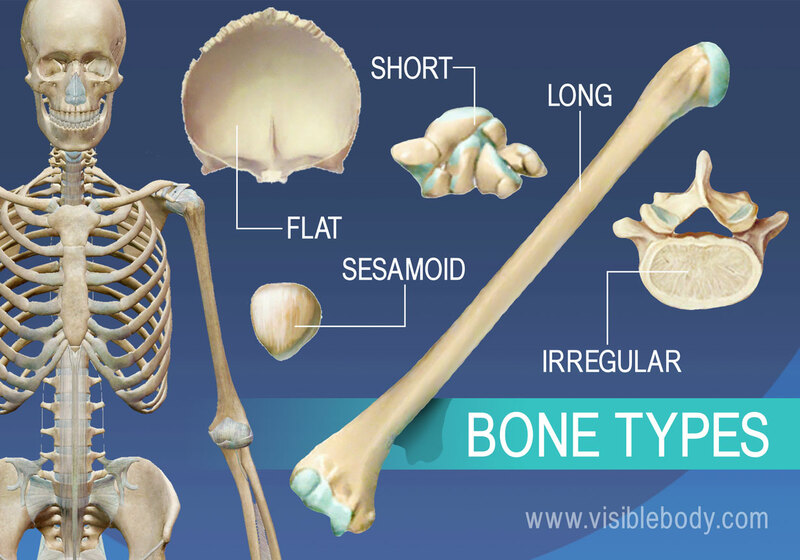 These bones provide structure and protection and facilitate motion. Bones articulate to form structures. The skull protects the brain and gives shape to the face. The thoracic cage surrounds the heart and lungs. The vertebral column, commonly called the spine, is formed by over 30 small bones. Then there are the limbs (upper and lower) and the girdles that attach the four limbs to the vertebral column. The brain is surrounded by bones that form part of the skull. The heart and lungs are located within the thoracic cavity, and the vertebral column provides structure and protection for the spinal cord. How does the skeleton move? 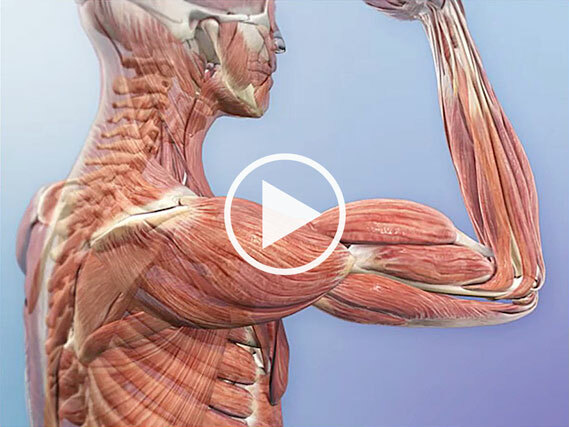 Muscles throughout the human body are attached to bones. Nerves around a muscle can signal the muscle to move. When the nervous system sends commands to skeletal muscles, the muscles contract. That contraction produces movement at the joints between bones. Bones of the appendicular skeleton facilitate movement, while bones of the axial skeleton protect internal organs. All skeletal structures belong to either the appendicular skeleton (girdles and limbs) or to the axial skeleton (skull, vertebral column, and thoracic cage). 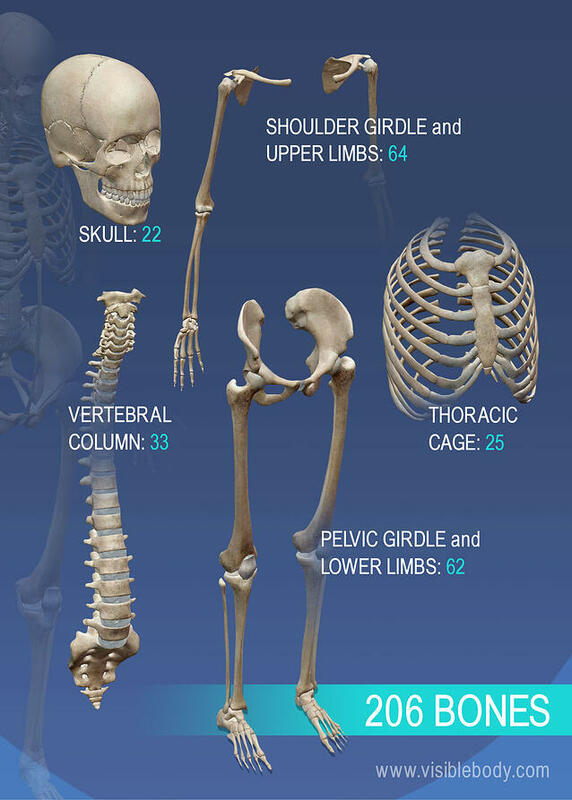 Bones of the human skeletal system are categorized by their shape and function into five types. The femur is an example of a long bone. The frontal bone is a flat bone. The patella, also called the knee cap, is a sesamoid bone. Carpals (in the hand) and tarsals (in the feet) are examples of short bones. The outside of a long bone consists of a layer of compact bone surrounding spongy bone. 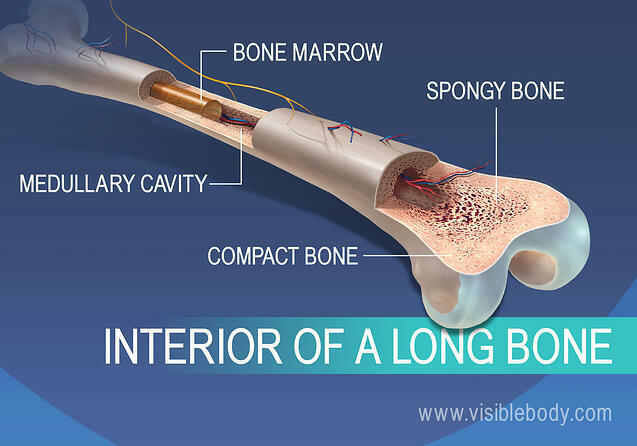 Inside a long bone is a medullary cavity filled with yellow bone marrow. Red bone marrow is soft tissue located in networks of spongy bone tissue inside some bones. 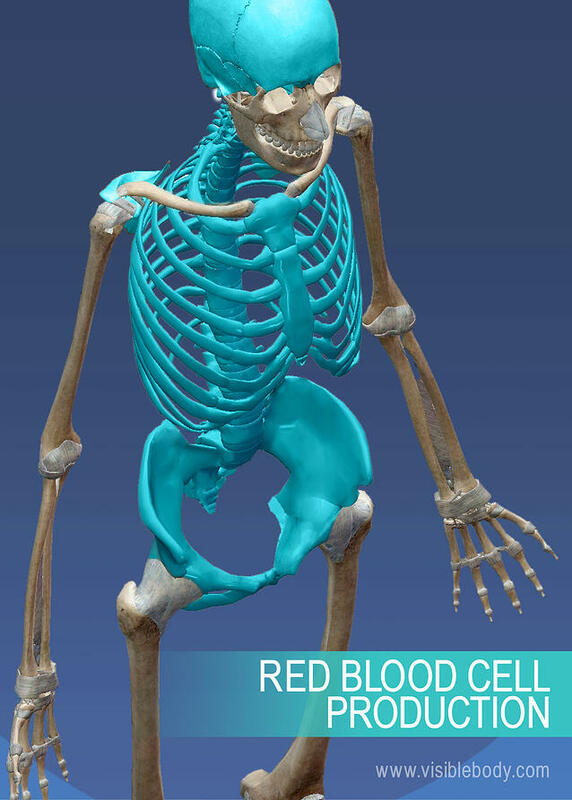 In adults the red marrow in bones of the cranium, vertebrae, scapulae, sternum, ribs, pelvis, and at the epiphyseal ends of the large long bones produce blood cells. One way to classify joints is by range of motion. Immovable joints include the sutures of the skull, the articulations between teeth and the mandible, and the joint located between the first pair of ribs and the sternum. 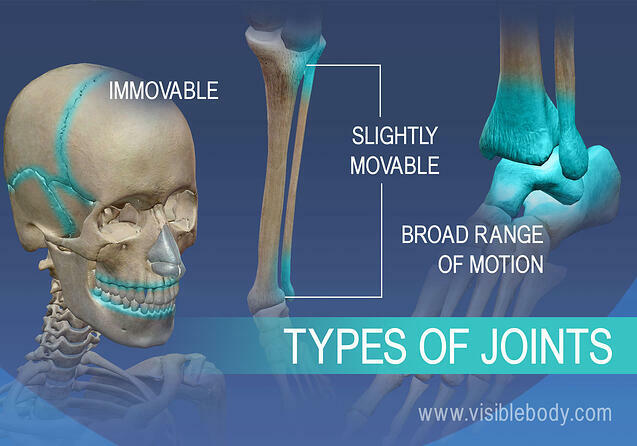 Some joints have slight movement; an example is the distal joint between the tibia and fibula. Joints that allow a lot of motion (think of the shoulder, wrist, hip, and ankle) are located in the upper and lower limbs. An infant skeleton has almost a hundred more bones than the skeleton of an adult. Bone formation begins at about three months gestation and continues after birth into adulthood. An example of several bones that fuse over time into one bone is the sacrum. 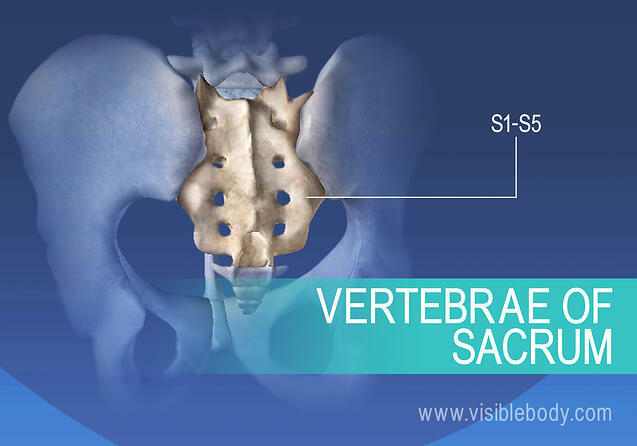 At birth the sacrum is five vertebrae with discs in between them. The sacrum is fully fused into one bone usually by the fourth decade of life. More information on bone marrow from Science Daily.